What's next for the Exelon-Pepco Merger? On March 23, the D.C. Public Service Commission (PSC) approved Exelon’s takeover of Pepco in a contentious 2-1 vote. Within hours, Exelon dissolved Pepco by suspending the trading of Pepco stock. This move resulted in $1.6 billion windfall for shareholders – a nice chunk of which went to Pepco executives – and allowed Exelon to claim that the deal was done. Pepco’s CEO Joe Rigby, cashed out nearly $25 million in Pepco stock before retiring and turning the Pepco (a company of Exelon) reigns over to David Velazquez (who made $5 million on the sale). Exelon’s takeover of Pepco still has two hurdles to clear. The new proposal removes the protections for residential ratepayers, meaning people's bills will go up - and soon - if the merger happens. These protections were key to the Mayor's settlement and to getting the Office of the People's Council to accept the merger. Without these protections, the merger should be untenable even to those who previously supported it. Tell the Mayor and OPC that this merger is looking worse than ever before. The District of Columbia Public Service Commission, at the meeting held at 10AM on Feb 26th, announced that they rejected the proposed settlement agreement. Commissioner Fort provided a proposed alternative settlement agreement to be considered by the parties. 1. Is the proposed non-unanimous settlement agreement (NSA) in the public interest? Motion: Reject the proposed NSA. 2. Fort provides alternative terms. Contained various components, including removal of Exelon as the developer for solar projects as proposed in the NSA, addition of non-compliance penalties, etc. Motion: Allow settling parties to review the proposed alternative within 14 days and accept the revised agreement, or request other relief. If all parties accept the agreement, then the joint application for approval would be deemed approved as being in the public interest. Read the full text of the order here. ﻿The residential consumer protections the Mayor won in her August Settlement proposal have been rejected. The Public Service Commission's new proposal leaves residential customers vulnerable to higher bills this year. See how the Mayor's proposal was gutted, then take action urging the Mayor and the Office of the People's Council to reject this merger. "[The merger] would result in a more complex regulatory structure that would negatively impact the Commission’s ability to regulate Pepco." "At a time of change in the energy field, Pepco’s ability to adapt will be constrained by an increased management bureaucracy." "Pepco will become a second tier company in a much larger corporation whose primary interest is not in distribution, but in generation." ​"We are also concerned about the inherent conflict of interest that might inhibit our local distribution company from moving forward to embrace a cleaner and greener environment." "This decision is one of the most significant decisions that the Commission will ever make. " On August 25, 2015, the DC Public Service Commission unanimously rejected Exelon. ​Read the Public Service Commission's summary ruling here. 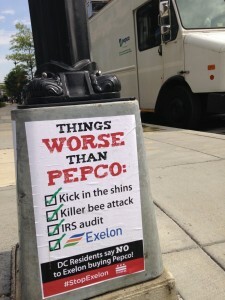 Don't love Pepco? You're not alone. Pepco has its (many) problems. But after looking into Exelon's history, its agenda, and its business, we can clearly say that Exelon would be worse than Pepco for the people of Washington DC. We call upon the DC Public Service Commission to protect the public interest: Reject the Exelon takeover (again) and then let's all get to work building a better energy future for DC. What's wrong with Exelon coming to DC? A lot. Most important, Exelon has a fundamental conflict of interest: Exelon's business model clashes with the interests of the people of DC. What's wrong with the new settlement deal? First, it's still a shockingly bad deal for DC. The risks and costs outweigh any fleeting benefits. Second, it happened in secret, and it's a really shady deal. The electricity sector is changing in ways that can benefit customers while improving reliability and cutting pollution. Because Pepco doesn't own any power plants and because of the nature of local regulations, DC is currently positioned to be a leader building a vibrant, low-cost, and local clean energy economy. Exelon's business model faces the opposite direction. Exelon is one of the biggest owners of electricity generation in the country. Its enormous fleet of nuclear power plants are in many cases no longer profitable. Instead of shifting into the future, Exelon is clinging to the past: it is lobbying hard and funding other groups to oppose local clean energy. Across the country, states are moving toward utility business models that encourage competition, innovation, and local control. DC should be at the front of this. Accepting Exelon in DC would lock the District onto a track leading in the exact opposite direction. Tying DC's energy future to Exelon Corporation poses risks that the District cannot reasonably accept. The job of bringing the District cost-effective, sustainable, non-volatile, consumer-centric solutions is not compatible with the business model of a nuclear-heavy, acquisition-oriented, debt-incurring holding company seeking to balance its risk-heavy portfolio with the ability to collect on bills in DC. The rate protections touted by settlement supporters are temporary. Importantly, there is no rate “freeze,” merely deferred payment on rate increases. Even the Apartment and Office Building Association, a supporter of the settlement, thinks this deal means significant rate increases. It forecasts that a typical Pepco customer could see her rates increase by $100 per year! By comparison, Exelon is offering a one-time payment of just $50 to customers. Since Exelon bought it four years ago, Baltimore utility BG&E has raised rates three times and is applying for a fourth rate increase. Why did Pepco give Mayor Bowser's office $25 million? 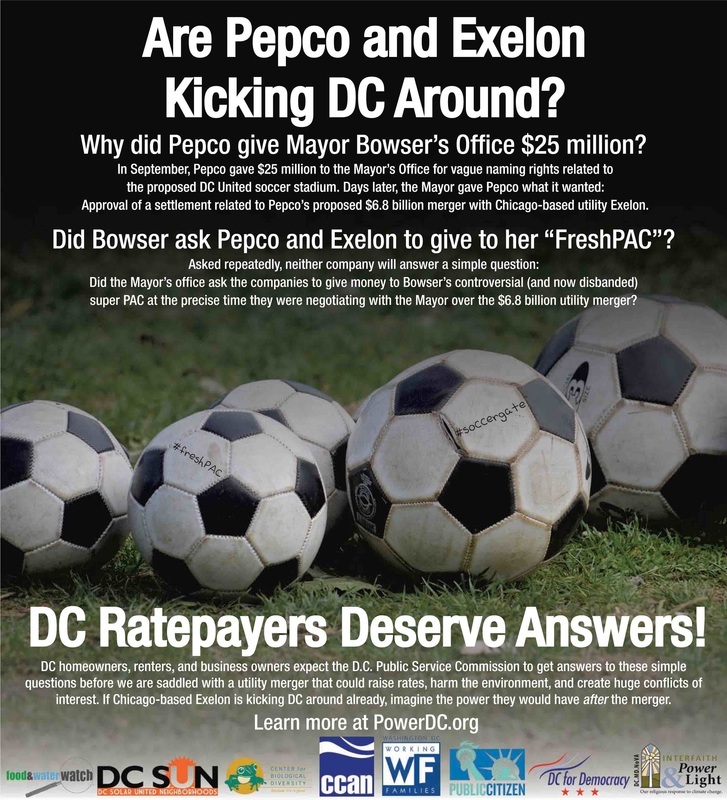 Did Boswer ask Pepco and Exelon to give to her political action committee? 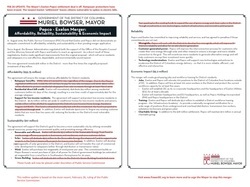 There remain many unanswered questions about the Mayor's about-face in agreeing to a settlement with Exelon and launching a marketing campaign around the 'new deal'. Learn more about #soccergate and #FreshPAC. Advisory Neighborhood Commissions from around the District have voted to oppose Exelon's bad deal. Here's one example from ANC 3B. In April 2014, the giant nuclear electricity company Exelon announced plans to buy Pepco, the electricity utility that serves Maryland and DC. Coming on the heels of a 2012 takeover of Constellation Energy and its subsidiary Baltimore Gas and Electric, the deal would make Exelon the dominant utility in our region. With its recent takeovers of utilities in Chicago and Philadelphia, Exelon would become the biggest power distributor in the United States, should the deal go through. For that to happen, the Public Service Commissions in the District and Maryland must approve it, finding that the deal serves the “public interest.” In August, regulators unanimously rejected the deal. But it didn't end there. Exelon and Pepco mounted a massive lobbying effort, and in September the Mayor announced that she had reached a 'new deal' with the executives. The PSC has reopened the review and must again decide if the merger is in the public interest. The public process will end this time on Dec 18, 2015, and the PSC will announce its decision sometime after that. Time and time again across the country, Exelon has shown that it works to benefit its shareholders not its customers. The sale of Pepco to Exelon will hand over the ownership of the local poles and wires and the right to sell power in the District to a Chicago-based corporation with a bad reputation. If getting good service from Pepco was a challenge, getting good service from Exelon could be harder. Exelon has made no commitment to improve reliability. In addition, Exelon is in a precarious place because it owns fleets of aging, expensive, and risky nuclear power plants. When some of its power plants proved uneconomic in Illinois, Exelon asked the local legislature to bail them out likely raising rates without any guarantee of long-term service. Exelon also frequently blocks renewable energy legislation at the state and national level. So what is the merger deal buying us? Less control, more risk, and likely higher rates and worse reliability. This is a bad deal for DC. A reduction in competition will likely result in higher costs for customers." This deal is bad for local citizens. It would lead to higher prices and a lower quality of service. Worse, it would restrict our ability to generate more power locally using solar and wind technologies." "Why DC Should Oppose the Exelon-Pepco Merger"
I am concerned that Exelon is purchasing smaller utilities as a means to diversify their assets and capture established customer bases, which they will use to subsidize the cost of decommissioning their nuclear facilities." The District is at an energy crossroads. Other states are putting in place policy that will foster Clean, Local, Efficient, Affordable, Reliable electricity. The Exelon merger would take us backwards at the very moment we should be looking ahead to better energy. Our choice is CLEAR. We reject the merger. Thousands of DC residents, a majority of Advisory Neighborhood Councils (ANCs), half of the participating DC City Council Members, and dozens of community groups have all spoken out against the merger, emphasizing that the proposed merger is not in the public interest. Read more and hear their voices here.